Time-Out Trailers founded by Keith Snelson started operation in 1974 (Elkhart - IN). 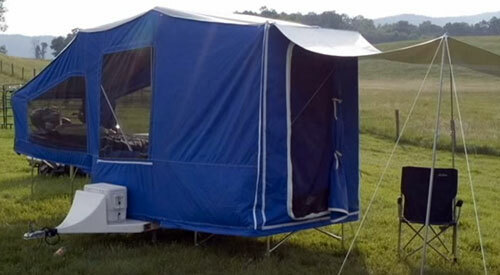 Since the beginning the company focused on designing and manufacturing motorcycle campers. While today’s products largely differ from the original ones, the company’s main goal (making motorcycle trailers) and status (family owned business) did not change. Over the years, the company earned recognition for their quality trailers, but also for customer’s support, family values and love for nature. And frankly, these are the values shared by bikers’ community. If the car is mostly about “traveling”, the bike is a symbol of “Outdoor living” and bike camper is one of the means to make it more affordable and enjoyable…. Today the Time-Out Trailers offer four models of bike campers: Delux, Time-Out Camper, Easy Camper and Slipstream Camper as well as few motorcycle cargo trailers. Out of these four models we selected the Time-Out Camper as the best compromise between size, weight, space (storage and living) as well as price ($). The Delux camper is heavier and while its larger cargo space (23 cu.ft) may store more “stuff”, at the end it will be your bike’s towing capability and your personal “level of driving safety” that will set the limit on what you can take. So you may end-up not being able to fully enjoy the Delux Camper. On the other side of the “spectrum” – the Slipstream is the lightest from Time-Out campers, but it is designed for only one person and honestly – not the tallest one (if you want to enjoy comfortable sleeping). The last point is important, because all motorcycle campers (and trailers) can be also towed by small cars (think “Smart”). And the Time-Out Delux (especially with its long list of adding extra weight options) probably will be one of good choices for Smart. However it may easily may cross towing limits of most bikes. 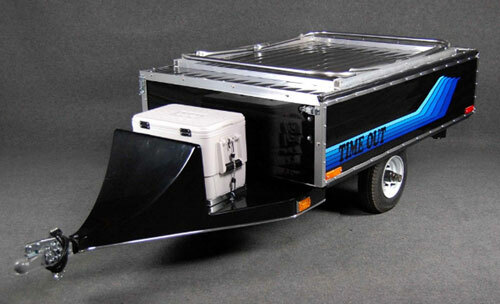 The Time-Out Camper is designed for towing by any 1000+ cc motorcycles (Harley-Davidson, Gold Wing, FJR…). While small and low profile when on the road, this camper becomes one of the largest in its class when fully set-up on the campground. It offers the spacious sleeping, dining and storage/entrance area totally “off-the-ground”. 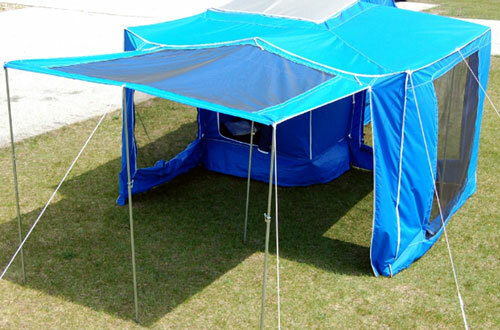 Think about rainy time when mud splashes on tent’s walls, when floor starts to float on the water. With the Time-Out Camper it will be just a distant memory (if you have such bad experience with traditional tent camping). 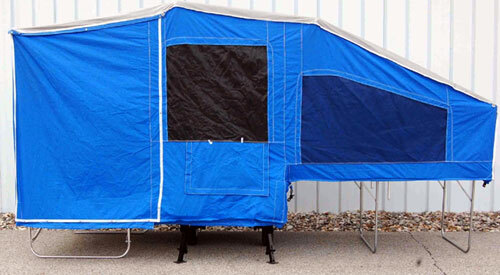 And the best of all - the entrance/storage and dining space both have impressive 78 inches of headroom, so you can freely move around, get dressed… Frankly, it’s a feature rarely seen in motorcycle campers. Five big windows with screens and privacy covers (3 in the sleeping area and 2 in the dining area) make the whole interior not only well illuminated and ventilated but also seemingly more spacious than it really is. Another benefit is the overwhelming feeling of “personal” contact with the Mother Nature…. Two tinted transparent plastic window covers that can be zipped into dining room windows offer privacy as well as protection against rain. The entrance includes full-size screened doors. 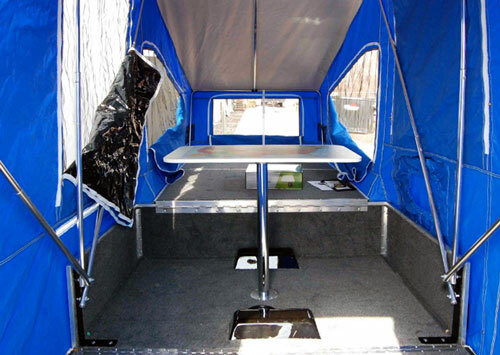 The Time-Out Camper comes with essential standard features including full-size air mattress, table, folding chair, two tinted clear plastic windows and fully carpeted floor (to name most important ones). The mattress (54” x 78”) will need air-pump (not included, but easily available). Once inflated, it will expand 8 inches thick promising comfortable sleeping. 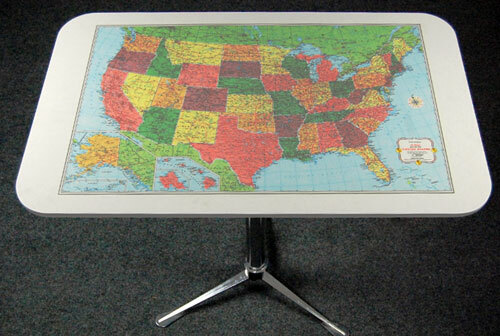 The standard table mounts directly to trailer’s floor in the center of the dining section. It will be stable and well serving its purpose. However, if you want to move the table outside, the optional tripod is necessary. Despite the fact that the camper is designed for two persons, as the standard feature the company offers only one folding chair. It’s somehow unexpected and disappointing so you may have to order an extra (optional) chair(s). When folded (road configuration), the camper provides up to 16 cubic feet of storage space. However you have to keep in mind that part of the storage is already taken by standard features (for example folded tent, mattress, chair etc….). The exterior rack at the top of the camper trailer can offer more storage space. 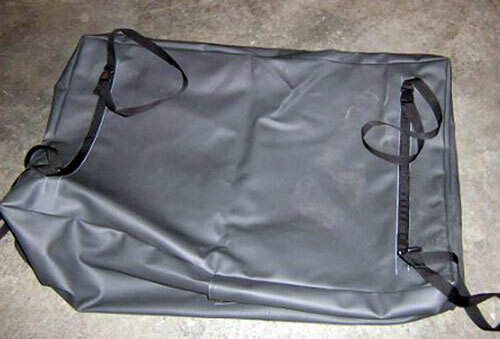 For that purpose the company offers an optional waterproof Luggage Bag (40” x 26” x 12”) easily strapping to the top. The tongue-mounted cooler (optional) is certainly one of indispensable items you want to take with you on-the-road. 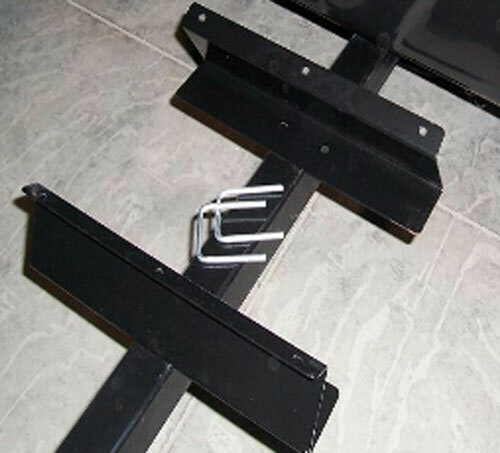 In case you have your own, the company offers the inexpensive mounting kit. Thanks to Time-Out’s clever design, you can access the tongue-mounted cooler without stepping outside. On the dining room’s side wall there is a zipped port giving access to the cooler! It’s certainly greatly appreciated feature not only in rainy days. 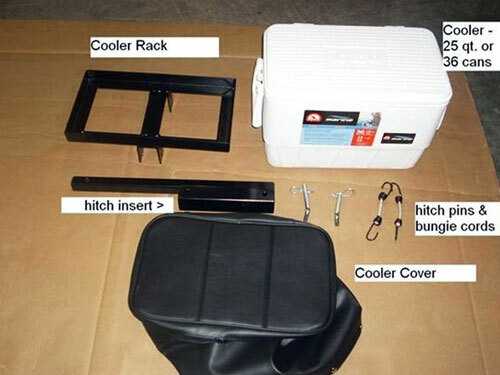 You can also opt for Timeout Cooler Rack Kit including 25 quart Igloo Cooler, tongue rack, hardware (insert, hitch pins and bungie cords) and cooler cover. The latter is made from Naugahyde material with snaps at the bottom and a zipper around the top so you can access the cooler without completely pulling off the cover. 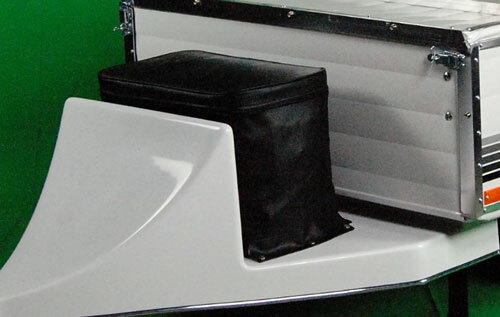 The “luxurious” Cooler Package additionally offers a molded fiberglass holder with an aerodynamic nose. But you have to carefully weight pros and cons of this solution. On one side it adds stylish accent of elegance to otherwise “traditional” trailer’s shape. It also decreases fuel consumption thanks to its aerodynamic shape, but on the negative side, it adds few extra pounds of weight. If you choose the Cooler Package, it is the best to order it with the new camper. Otherwise, it is a bulky item for shipping and once received, you will have to provide machine screws, nuts and washers (OK, not big deal), but also drill “custom” holes in the holder to match these in the camper’s frame. Cooler Package includes molded-fiberglass aerodynamic nose. Wrapped around Screen Room (about 96 square feet / 30 lbs ). All these options are “ground-based” (compared to “off-ground” camper’s tent) and do not have floor. Each of them will considerably extend the living space and if needed provide shelter for your bike in rainy weather… The choice is yours based on needs, ability to tow extra weight and available storage space (when on the road). 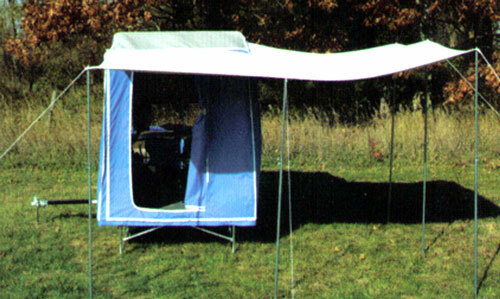 Obviously the cost will be also one of the factors (The front Awning goes for about $170, while the Screen Room for about 800$). Spare: When something can go wrong, it certainly will! We witnessed this well-known Murphy’s law so many times that we should seriously consider getting optional spare wheel and mounting bracket. The wheel mounts under the trailer’s tongue so it does not deprive you from the storage space, but yes, it eats your cargo capacity (weight). Swivel Coupler – it’s one of these items that are essential for your safety on the road. 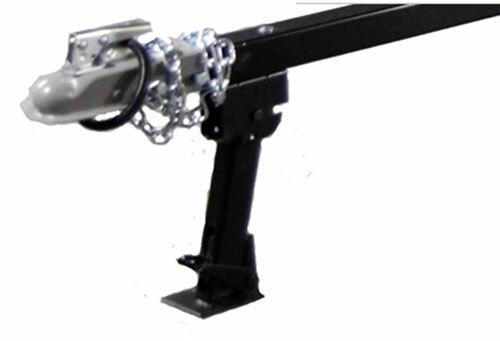 It extends the typical +/-20 degrees side-to-side motion in the coupler to full range angle. As the results you gain much better handling on the road and added safety (if for some reasons the bike goes down, the trailer will stay in an upright position). 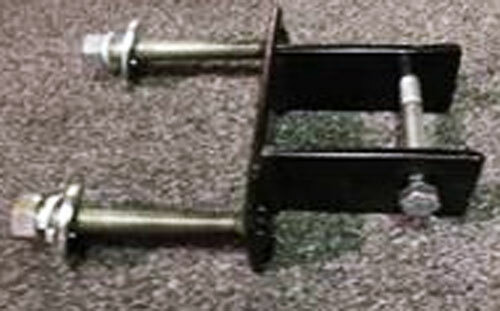 Note – the Swivel Coupler is mounted between the end of the trailer’s tongue and the hitch coupler and adds about 4 inches to the overall length of the trailer. A/C Unit: The camper’s tent has provision for an air conditioning unit in form of adjustable-size opening (max 24” x 14”) for A/C’s vent. 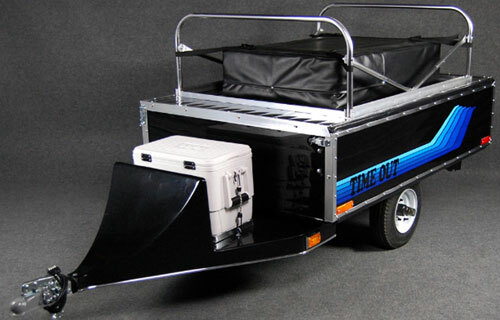 For that purpose the Timeout Trailers offers an optional A/C support rack. But frankly, it is not the best solution for bikers given too much of extra weight to be towed behind (I’m pretty sure you can make better use of camper’s cargo capability). So I assume, this option is rather addressing needs of small car drivers towing Time-Out camper. LED Fiberglass Light Bar is another non-essential option. It mounts at the back of the camper giving it the fancy look. Although the factory claims that it adds extra visibility on the road the truth is that the regular taillights are large and strong enough to guarantee your safety. So frankly, the LED Light Bar will rather help to empty your valet and add extra weight offering only the questionable gain of “modernity”. It’s worth to mention that the list of options is really long, so you can easily customize your camper. Stability: The large “off-ground” sleeping and living space does not come for free (in other words may not be fully “trouble-free). The sleeping area is entirely supported by two U-shaped tubing frames. While manufacturer claims that the bed can hold the weight up to 1,000 lbs, I guess it all depends on the terrain and weather conditions. As the U-frame does not have sand/mud pads, it may not be “rock-stable” in some situations. The entrance support is similar to the one used in the sleeping area and hence prone to similar problems, maybe even more aggravated due to “dynamic loads” (walking, moving, stepping in/out…). The dining area is supported by trailer’s frame sitting on two wheels and four corner stabilizing jacks. That gives more stability and no wonder – it is rated by Timeout to hold up to 2,000 lbs. The set-up and pull-down process is certainly more complex that in let’s say Slipstream camper. And understandably it takes more time. Although it is highly individual, after gaining experience you can do it in less than 10-15 minutes. What is the major inconvenience? Well, to set-up the tent you have to remove all items from the storage (trailer’s body) as it will be converted into dining area. Once the process is finished you may store the “stuff” back in the “off-the-ground” entrance, but all that takes precious time. It’s probably not a big deal when you are setting-up/pulling-down your camper during the day or in nice weather conditions. But it is kind of “headache” when it (heavily) rains. But this is the real life: something for something. And in the case of the Time-Out Camper what you gain is some of the largest “off-ground” sleeping and living space. Note: The pictures are courtesy of websites: Time-Out Trailers and wikco.com.